Turkish authorities previously arrested one of the perpetrators of the Brussels suicide bombing only three days after his arrival in Turkey via Antalya airport, Daily Sabah has learned. 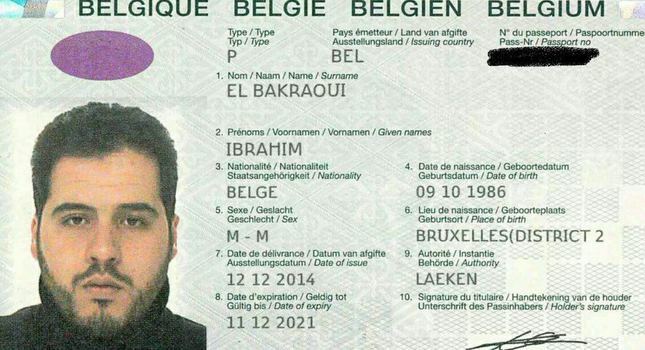 Ibrahim El Bakraoui (29), one of the two brothers identified by Belgium for being responsible for the attacks that killed at least 31 people in Brussels on Tuesday, entered Turkey on June 11, 2015, and was detained by Turkish authorities on June 14. He subsequently got deported on July 14, 2015, a senior security source said. Turkish authorities detained El Bakraoui for using a similar route that is used by foreign militants attempting to join Daesh and being in contact with suspected terrorists, sources said. Turkish police apprehended El Bakraoui during a routine police check to catch possible terror suspects in Turkey's Gaziantep province and deported him from Istanbul Atatürk Airport. The Turkish official said, "We notified Belgium's and the Netherlands's authorities about his travel route and put an exclusion order on him." British news wire Reuters reported that in previous cases, officials have said that they cannot jail people deported from Turkey without evidence of crime, such as proof showing suspects fought in Syria. Brahim Abdeslam, one of the suicide bombers in Paris in November, was also sent back to Belgium from Turkey early last year. President Recep Tayyip Erdoğan on Wednesday revealed for the first time that Turkey had previously deported one of the Brussels terror attackers and had notified Belgian authorities. ''Belgian embassy was notified on July 14, 2015 about the deportation of the attacker, who was later released in Belgium'' Erdoğan said and added that Belgium could not find terror links with the suspect, despite Turkey's warnings. Erdoğan continued by saying that the Netherlands was also involved in the matter as the suspect was deported to the Netherlands at his own request and the Dutch authorities were also informed about the incident.